NOTE: Please follow our directions because we will have the most updated information. Apps, GPS and online maps (such as Google maps) don’t work as well in the countryside. During 2017, bridge replacement will make following the GPS route impossible. 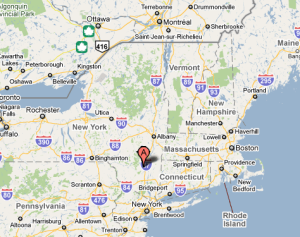 Click here to see a weather report for Stone Ridge, NY. By Car from the New York Thruway – take the New York Thruway (87) to Exit #19 (Kingston); follow the signs to Highway 209 South. Once on 209 South, go 9 miles to Stone Ridge. Look for a Mobil gas station on the left. Just before the station, turn left onto Leggett Road. Go about 1/4 mile and you will see our sign and entrance on the left side of the road. Purchase a ticket to Rosendale, New York. Note:Please take a bus that arrives in Rosendale before 9:30pm. Find out when the bus reaches Rosendale, and call the Retreat (845) 687-4574 to let us know which bus you are taking so we can meet you at the Rosendale bus stop. Buses to and from Rosendale usually take about two hours. From La Guardia or JFK Airport Take the Grey Line bus that goes to the Port Authority in Manhattan. Please note: there are several Grey Line buses, so be sure to ask the driver if it goes to the Port Authority. By bus – take bus to Rosendale from the Port Authority, directions above. By train – get to Penn Station in Manhattan. Take the Amtrak train to Rhinecliff, NY. Call the Retreat before boarding train to tell us when to meet the train in Rhinecliff.